S'Krivva, a Khajiit monk, is a Shadowfoot of the Thieves Guild and one of the two Doyens who will provide you with special jobs. She operates out of Bravil and will take over from Armand Christophe once you reach the rank of Bandit. She is sometimes referred to as S'krivva, a more common spelling of Khajiit names. Due to her profession and high rank within the Guild, S'krivva keeps a low profile in Bravil, although she is a steady regular at the Lonely Suitor Lodge on the other side of the canal. She sleeps in her upstairs bedroom every night between midnight and 6am and always starts the day with a two-hour meal seated at the table near her bed. With the exception of Tirdas and Turdas, she then heads downstairs and spends twelve solid hours studying her copy of Thief of Virtue comfortably seated near the fireplace. At 8pm, she finally leaves the house and crosses the bridge for dinner at the Lonely Suitor Lodge. At 10pm she returns to her house and spends the remaining two hours of the day wandering around on the ground floor. On Tirdas and Turdas, however, she spends most of her day in the Lodge; after only an hour with her book she departs for the inn at 9am and spends the next eleven hours socializing with the other regulars of the Lodge. At 8pm she resumes her usual routine. Her outfit consists of a mixture of middle and lower-class clothing, including a burgundy linen shirt with a pair of laced leather pants and doeskin shoes. She is armed with a steel bow and eleven steel arrows and a leveled dagger as back-up. She carries her copy of Thief of Virtue, a pewter mug, 15 lockpicks, her house key and a leveled amount of gold. In combat she also relies on a set of leveled monk spells, including a Shield spell, a fire, frost or shock shield spell and a Burden spell. If you meet her before joining the Thieves Guild, she will formally introduce herself: "Yes. S'krivva gives you greeting. Luxury imports, exports are S'krivva's fair game." If you inquire about her home city she will play innocent: "Well, perhaps, yes, one hears such things, what is one to believe? That S'krivva collects goods of untestable provenance? Pshaw. Rumors." After the quest May the Best Thief Win, when you have joined the Guild, getting near S'krivva will cause her to blow her cover and say: "You are a skillful thief. The guild is lucky to have you." She will also provide a new opinion on Bravil and the lack of opportunities for a thief: "Bravil perhaps presents little scope for an ambitious member of our guild. Perhaps you may find the castle entertaining. Little else." She will also provide unique information about the Guild and tell you about the advantages of membership if you get a bounty: "The hunter can pay his fines to the guards, serve his time, or pay this one half and they will all go away." If you choose to let her take care of business, she will promise: "It will be done. I will shred all of the hunter's criminal warrants." If you tell her you can take care of yourself, she will just comment: "This one hopes the hunter enjoys the cage." When asked about the meaning of a 'Doyen' S'krivva will inform you: "The Doyen are the eyes and claws of the guildmaster. As a hunter, you take orders from them, and you get your favors from them. This one is a Doyen. Armand Christophe is a Doyen." If you have committed a crime against a fellow guildmember, causing you to be expelled, S'krivva will angrily say: "The hunter has performed foul deeds upon other members of the pride. The Thieves Guild prohibits murder, assault and theft against fellow members. The pride casts out the hunter until the fine is paid. Is the hunter prepared to pay the fine?" If you have yet to raise the money, she will hatefully say: "This one turns her back on the hunter. Return when the fine can be paid." If you have the money and hand it over, it is another matter: "Sweet! The hunter is restored. The pride welcomes the hunter once again." After the imprisonment of treacherous informant Myvryna Arano, Armand Christophe will promote you to Bandit and point you towards S'krivva for more work: "Sadly, I don't have anything for you. I only work with the less experienced guild members. You should go see S'krivva in Bravil from now on. You can find her at the Lonely Suitor lodge. I wouldn't recommend bothering her at home, unless the door is unlocked." When asked again, an angry Armand will repeat: "Are you deaf? Didn't I already tell you that she is in Bravil?" In Bravil, the two beggars, Wretched Aia and Cosmus the Cheat, will back up Armand's advice: "I'd look in the Lonely Suitor. She takes her meals there. If you try her house, don't pick the lock to get in. She won't like that." These statements are almost true; while S'krivva will lock her door between 10pm and 6am, she will only get angry if you approach her while she is asleep: "I am busy. Get out. When I am ready to conduct guild business, I'll leave the door unlocked." If you get near her when she is awake, she will say: "The blessing of the Fox upon you." and follow it up with "Ah, you are the new thief. I am your new Doyen. ", starting her string of quest-related events. Lastly, S'krivva will play a surprising part in the Security Training quest. When you ask high-ranked Thieves Guild member J'baana for master training, he will only accept if you do him a favor; "Since you are here, and since you want something, you are useful to me. Travel to Bravil, and speak with S'Krivva. She should have a message for me." and will, if you refuse, angrily add: "Until you have the message from S'Krivva, we have nothing further to say to one another." When you ask S'krivva about this, she will be quite surprised but will reveal nothing of what's going on, Instead she will hand you a note: "What? I... J'baana was informed already.... The delays are not my fault... Here, take this to him. It is not my fault. The job will be finished, I swear it." Asking her again will have her say; "I've given you the message. There's nothing more I can do." Back in the Prison District, an anxious J'baana will ask: "Have you returned with a message from S'Krivva?" but will reveal nothing about the transaction. Ahdarji's Heirloom: Recover a ring stolen by a freelance thief. Misdirection: Help the Thieves Guild get the waterfront back to normal. Cast out of the Thieves Guild: Regain your honor among thieves. Security Training: Act as a courier for the master of security so he will train you. On Loredas, S'Krivva was supposed to hang around the statue of the Lucky Old Lady from 10am to 2pm, apparently to pick up a skooma delivery. However, her reading package takes precedence. S'krivva was supposed to have a different greeting if you talked to her for the first time after joining the Guild. Unfortunately, the line can never be heard in-game: "Ah. S'krivva hears of you. Welcome, and well-fare in your craft and trade." During Misdirection, S'krivva was supposed to comment on the quest after you have picked up the Note from Raminus Polus. However, the corresponding quest stage 40 is missing from the game and S'krivva's advice can never be heard: "The Arcane University is getting restless. They have not gotten their Icestaff back. If it is not returned soon, they will let Lex return to the Waterfront. You must finish the job. Go now!" Asking S'krivva about the "Three rules" of the Thieves Guild will produce the same response that Armand Christophe gives, including saying that the beggars are "under the personal protection of the Gray Fox, particularly here on the waterfront", despite her being in Bravil. If you have yet to fence 200 worth of gold from either Ongar or Dar Jee, asking S'krivva for 'special jobs' will make her reject you: "Sadly, you must demonstrate more skill before I can allow a commission job. Sell more stolen treasures to the fences. They will let me know when you have proven skillful enough." and finish the conversation with: "Good hunting". Once you have fenced the 200 gold, S'krivva will offer a new commission job:" I have a special request from the widow of a former fence in Leyawiin. As your new Doyen, I am asking you to help her. A street scavenger made off with a ring that the widow Ahdarji values highly. She is offering a reward. The guild frowns on freelance thieves. Are you willing to go to Leyawiin, find the ring, and get it back to Ahdarji?" If you reject this offer, she will say: "I'm short on skilled thieves of your rank just now. If you change your mind, come back and see me." If you accept she will, without anymore information, send you on your way to Leyawiin and Ahdarji with: "This is good. Go to Leyawiin. Speak with Ahdarji and help her find her ring." After your conversation with the imprisoned Amusei you are advised to return to Ahdarji for more information. However, S'krivva will also have a piece of advice: "The guild is contracted to recover the ring. It matters not that Amusei does not have it. You must get the ring where ever it may be." After you have acquired the Ring, returning to S'krivva and asking her about 'special jobs' will make her point out your stupidity: "I don't want that ring! It's too hot to sell. You are supposed to take it to Ahdarji. I swear, the new recruits are getting worse." After delivering the ring to its rightful owner, S'krivva will welcome you back and promote you to Prowler: "Good work. You are truly an asset to the guild. I will make sure the Gray Fox himself hears about this. I am promoting you to Prowler. Congratulations." If you managed to kill the wrong person during the quest, a furious S'krivva will demand you pay the blood price before she will speak to you: "Fouled meat! You have returned Ahdarji's ring, but have also broken the covenant of the guild. Killing is not allowed. You are no longer a member of the Thieves Guild until blood price is paid for the lives you took." When you pay the price for your deeds she will welcome you back and promote you: "This is good. Your honor is restored. Your overdue promotion may now be granted. 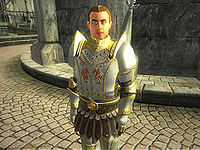 I am promoting you to Prowler in the Thieves Guild." After the success in Leyawiin, S'krivva will now look at you and say: "Ah, the Prowler approaches. ", then greet you with a surprising "Amusei sends his regards." or a more normal: "What can a humble Doyen do for a sly thief?" Rules are rules, however, and when asked about a job, S'krivva will say: "You are unproven, or at least insufficiently proven for the tasks this one has available. Gold is the blood of the Thieves Guild. Keep the fences busy and rich. Then come to see me." After you have fenced stolen goods for 300 gold, she will be more welcoming and hand you the quest Misdirection. "I have a small problem that you may be able to help with. The guild will even pay a reward. That buffoon, Hieronymus Lex, has invaded the Imperial City Waterfront. Imperial Watch guards from all over the city prowl the streets. Hieronymus Lex has vowed not to leave until the Gray Fox is in custody. The Fox is safe, but the Thieves Guild cannot do business like this. The poor of the Waterfront are kindred to the Gray Fox, and will not betray him. However, cubs soon get hungry. Soon someone will break. Many guild members could be jailed. Find Methredhel in the Imperial City. She is co-ordinating the guild's response." She will also provide her unique opinion on the Gray Fox: "He is the greatest of all thieves. I have heard it said that he stole his gray cowl from Nocturnal herself." She will send you off to Methredhel with: "Shadow hide the hunter." For the longest time, S'krivva will remain silent in her house in Bravil, at least until you have witnessed a Dremora hand Lex a note from Raminus Polus. Lex will then start evacuate and Methredhel will tell you to return the Hrormir's Icestaff to the Arcane University. When all is said and done, she will congratulate, reward, and promote you: "Hieronymus Lex has left the Waterfront? Well done! Methredhel's report tells me that you have done well. You have earned your reward. I am promoting you to Cat Burglar, which means you can use Luciana Galena of Bravil as your fence. Congratulations on your new rank." If you failed and shed innocent blood her reaction will be quite different: "Hieronymus Lex is no longer searching on the Waterfront? This is good. It's too bad you slew innocents to make it happen. The guild turns its back on you until the blood price is paid. Until then, leave my sight." When you pay the blood price, everything will be forgiven and she will welcome you back and promote you anyway: "You have restored the honor of the Thieves Guild. This one welcomes you back into the guild. I am promoting you to Cat Burglar." 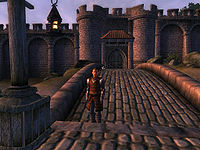 With the Waterfront back on track, S'krivva will have the next contract ready, presumed you have fenced at least 400 gold in the Independent Thievery quest: "You must do more to fill the guild's treasury before I can assign you commission jobs. Seek more loot. Keep the fences busy with your profits. Then we can talk." She will also start to say: "We meet again." and "You are a welcome sight in these troubling times." With 400 gold fenced, S'krivva will hand you the next contract: "I have need of a very special book, the Lost Histories of Tamriel. 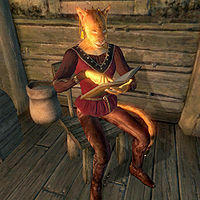 The cat burglar Theranis was sent hunting in Skingrad for this book. However, Theranis has not been seen since. The Gray Fox himself hunts for this book. I need you to find Theranis. Help Theranis bring back this book. If Theranis is unwilling or unable, bring back the book yourself. Are you agreeable?" If you choose to turn her offer down for now, she will comment: "Maybe Theranis will return soon, maybe not. If you grow bored and change your mind, ask me again." If you accept, she will simply send you to Skingrad with: "That is good. Go to Skingrad. The trail starts there." If you ask her again, she will say: "Doesn't the hunter have prey to follow?" After your encounter with Amusei, the Pale Lady and the deceased Theranis, returning to S'krivva without the book will have her ask: "You have found Theranis and the Lost Histories of Tamriel?" When you tell her, she will be most disappointed: "The prey escapes. Return when you have the book or know that Theranis will return with it." When you have picked up the book, you will have to tell her the sad truth: "Theranis is dead? I grieve for him. But at least you have the book. The Gray Fox has sought this book for many years. You have earned the reward. Here is your payment." If you managed to slay innocent victims during the mission, S'krivva will instead say: "Theranis is dead? I grieve for him. But at least you have the book. The Gray Fox has sought this book for many years. All would be good if you had not killed to get it. The Thieves Guild has no use for you until you pay the blood price. I do not wish to set eyes on you until you can cleanse the guild's honor by paying blood price. Go now." When you pay her the price, you will be reinstated in the Guild and will get your reward: "Your honor is restored. The Thieves Guild welcomes you back. This one may now pay you for finding the book." For S'krivva to give you her last secret job you will have to fence at least 500 gold; otherwise, she will send you away with: "You are skillful, but not skillful enough. Prove your worth to me. Provide the guild fences with the bounty of your work, then return." Due to your recent promotion, she will also greet you with: "Welcome, honored cat burglar." and "The esteemed cat burglar honors me." When you have fenced the 500 gold, she will inform you about the task at hand, Taking Care of Lex: "Hieronymus Lex must be eliminated once and for all. The Gray Fox has asked that you do this personally. It is a most delicate matter." She will then proceed to describe the complex plan: "Countess Umbranox of Anvil, is hunting for a new captain of her guard. The Legion Commander of the Imperial Watch sent her a list of candidates. The Gray Fox wants this list replaced with one that highly recommends Hieronymus Lex. From Anvil he can do little harm to the guild." When asked about the original letter, S'krivva will point you towards manipulative Castle Steward Dairihill: "The letter is currently in steward Dairihill's desk. She has lied to Lady Umbranox, telling her that the letter has yet to arrive." When you ask why they don't just kill Lex, she will remind you: "We are thieves, not murderers. That is the province of the Dark Brotherhood. For reasons unknown to this one, the Gray Fox has extended his protection to the Umbranox family and Lady Umbranox in particular. While Lex is a problem for the guild, his unwavering loyalty and resolve make him the perfect protector for Lady Umbranox." When asked about how to forge the letter, S'krivva will not be of much help: "You will have to track down one on your own. I don't know of any in Bravil. With the forged letter in hand, sneak into the Legion Commander's office in the Imperial City Prison and seal it with his seal. Dairihill cannot be trusted. You must deliver the letter to Lady Umbranox in person. Will you accept this commission?" If you decline, she will send you away with: "I am disappointed. When you are better prepared, return to me." If you accept, she will say: "That is good. Remember, this is a mission of stealth, not blood. Your payment will be higher than normal to cover the expense of the forgery." She will send you to Anvil using her old farewell: "Shadow hide the hunter." During the lengthy quest, S'krivva will keep quiet in Bravil, unless you pay her a visit right after stealing the original letter from Dairihill: "Hieronymus Lex is still in the Imperial City. Do not speak to me of this again until the letter is properly replaced." She will not say anything else until Lex has been reassigned to Anvil. She will then welcome you back with: "You are a credit to the guild." She will then promote you and conclude: "Well done, hunter! Hieronymus Lex will no longer be a thorn in the paw of the Thieves Guild. The Gray Fox shows his gratitude. You are being promoted to Shadowfoot, and may now use Orrin of Castle Anvil as your fence." However, if you failed and shed innocent blood during the quest, she will say: "Hieronymus Lex has indeed been reassigned. However, you have slain needlessly to accomplish that goal. The hunter is cast out of the pride. You are no longer a member of the Thieves Guild until the blood price is paid." When you hand her the blood prize, you will be reinstated in the Guild and get your promotion and reward anyway: "Welcome back into the guild. For getting Lex reassinged [sic], you are being promoted to Shadowfoot. Congratulations." After Lex has been reassigned, S'krivva will have no more jobs for you but will hint at an upcoming rendezvous with the legendary Gray Fox: "I have no more jobs for a thief of your skill. You have no need of the Doyen to provide you work. However, there are rumors that the Gray Fox himself may call on you soon. Wait for contact from him. Keep the guild fences busy." This will end S'krivva's line of quests but talking to her later on will net you some new dialogue; after Turning a Blind Eye she will comment: "I only provide work for less skillful thieves. If you take their jobs, what will they do for a living? The Gray Fox himself may call on you soon, though. Wait for contact from him. Keep the guild fences busy." After Arrow of Extrication she will change her advice to: "I only provide work for less skillful thieves. If you take their jobs, what will they do for a living? The Gray Fox himself may call on you soon, though. Wait for contact from him. Keep the guild fences busy. You can find your own work." After your first conversation with the Gray Fox during Boots of Springheel Jak she will say: "You have to find your own jobs now. Just keep selling stuff to the fences. The Gray Fox is watching your career carefully. He may contact you soon with a special job."